I had a computer in the shop recently that wouldn’t wake up from sleep mode using the keyboard or mouse. Some of the Dell XPS 8910 desktops have on-board graphics and a separate graphics card installed. If you have this problem, check to see if you have one of the models with the extra graphics card installed. 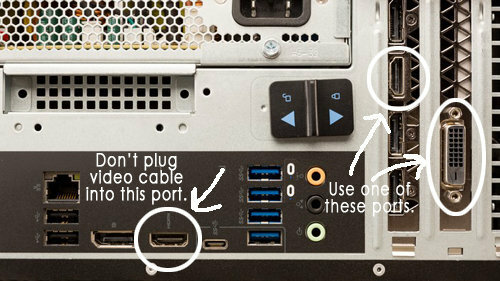 If you do, you need to connect your monitor to the separate graphics card and not the on-board HDMI port. The HDMI port on-board will work for graphics, but when you put it to sleep and try to wake it, it’s looking for a connection to the separate graphics card and it won’t wake up. When you’re connected directly to the extra graphics card this problem is solved. If you prefer to use the on-board graphics, you’ll have to remove the extra graphics card that is installed in the PC. Then you won’t have the problem of it not waking up with the keyboard or mouse. This is not recommended however, as it causes more stress to the motherboard.